ਇਰਾਨ ਦੇ ਪਿੰਡ ਵਾਸਤੇ, ਦੇਖੋ ਅੰਦੀਜਾਨ, ਇਰਾਨ. ਬਲਕਬੋਸ਼ੀ ਜ਼ਿਲ੍ਹੇ ਵਿੱਚ ਪਿੰਡ ਵਾਸਤੇ, ਦੇਖੋ ਅੰਦੀਜਾਨ (ਪਿੰਡ). ↑ Ziyayev, Baxtiyor (2000–2005). 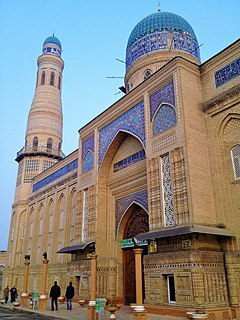 "Andijon" (in Uzbek). Oʻzbekiston milliy ensiklopediyasi. Toshkent: Oʻzbekiston milliy ensiklopediyasi. ↑ 4.0 4.1 "Andijon" (in Uzbek). Ensiklopedik lugʻat. 1. Toshkent: Oʻzbek sovet ensiklopediyasi. 1988. pp. 42–43. 5-89890-002-0. ↑ Manz, Beatrice Forbes (1987). "Central Asian Uprisings in the Nineteenth Century: Ferghana under the Russians". Russian Review. 46 (3): 267–281. JSTOR 130563. doi:10.2307/130563. ↑ Khalid, Adeeb (1998). The Politics of Muslim Cultural Reform: Jadidism in Central Asia. Comparative studies on Muslim societies. Berkeley: University of California Press. p. 59. ISBN 0-520-21355-6. ↑ 8.0 8.1 "Preliminary findings on the events in Andijan, Uzbekistan, 13 May 2005". Organisation for Security and Co-operation in Europe. Warsaw. 20 June 2005. Retrieved 7 April 2014. ↑ Beehner, Lionel (June 26, 2006). "Documenting Andijan". Council on Foreign Relations. Retrieved 7 April 2014. ↑ 10.0 10.1 Burnashev, Rustam; Irina Chernykh. "Changes in Uzbekistan's military policy after the Andijan Events". China and Eurasia Forum Quarterly. 5 (I): 67–73. ↑ Usmanova, Dilya. "Uzbekistan: Andijan - A policeman's account". Institute for War and Peace Reporting. Retrieved 7 April 2014. ↑ Donovan, Jeffrey (1 September 2008). "Former Uzbek spy accuses government of massacres, seeks asylum". RFE/RL. Retrieved 7 April 2014. ↑ "The Andijan massacre a year after". Columbia Radio News. 10 June 2007. Archived from the original on 20 Aug 2013. Retrieved 7 April 2014. ↑ "Border situation between Uzbekistan, Kyrgyzstan returns to normal". ReliefWeb. 26 May 2005. Retrieved 7 April 2014. ↑ C. J. Chivers; Ethan Wilensky-Lanford (17 May 2005). "Uzbeks say troops shot recklessly at civilians". The New York Times. Retrieved 7 April 2014. ↑ "Uzbek troops clash with protesters". CNN. 13 May 2005. Archived from the original on 28 September 2013. Retrieved 7 April 2014. ↑ "Uzbekistan: 'Bullets were falling like rain'". Human Rights Watch. Retrieved 7 April 2014. ↑ Chivers, C. J. (23 May 2005). "Toe tags offer clues to Uzbeks' uprising". Retrieved 7 April 2014. ↑ "Uzbekistan: Karimov reappraises Andijon". RFE/RL. 19 October 2006. Retrieved 7 April 2014.